I just watched the sun set from 30,000 feet. The waning crescent moon spectated, its sliver of light like a wink saying, “I know, right?” She gets to see this every night, I was just lucky to be a transient part of the audience with it. The horizon was a perfectly distinct band of the visible light spectrum, one color stacked on another, superposed like sediment layers. Nearest the clouds was the streak of red, orange and yellow, a pastel furnace glow. Seated on top was the thin green, like chlorophyll’s reflection of the sun, small roots dripping into the thickness of the iron tint beneath. Then blue, like a deep crystalline ocean suspended in air, as the firmament was initially intended. Penetrating, mesmerizing. Finally violet, the most mysterious gem, cold with hints of life churning within, like the blackness of space it ultimately bled upwards into. 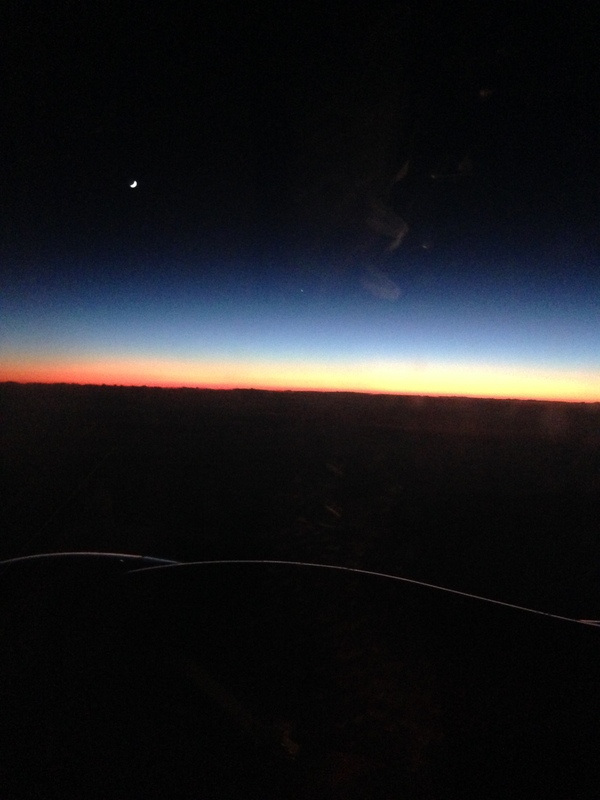 I watched the sunset from 30,000 feet; I saw all of terrestrial nature encapsulated in a single moment. This entry was tagged beauty, life, microcosm, nature, plane, prose, sunset, synecdoche. Bookmark the permalink.